for trade shows, conventions, annual meetings, and events big and small. that help drive advertising and sponsorship revenues. 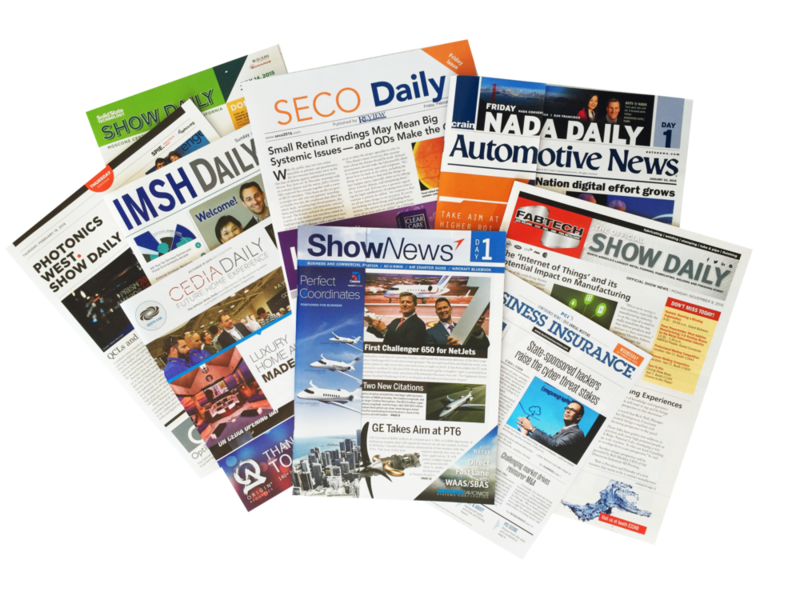 If you don’t have or can’t spare the resources needed to develop and execute a show daily magazine or video program for your event, Trade show Media Partners can do it for you as your partner. We listen to what you want and then produce the show daily or video program customized for you and your event. We generate the revenue from show daily advertising or video sponsorship so that there is no cost or risk to you and may even provide revenue sharing opportunities. Whether it's a large conference or trade show, or a small annual meeting, we can provide media solutions that will fit your event. If you have some of the resources needed for a show daily magazine or video program but still need expert help, Tradeshow Media Partners can provide support wherever needed as a fee-based service. For show dailies this can include onsite editorial, design/layout, printing, and distribution services. For trade show or conference video, this can include onsite camera operators, hosts, producers, and video editing. You generate the revenue from advertising and/or sponsorships and we help to make sure you deliver on your promises.